When I first started investing in stocks, this is one of the first books I picked up at the bookstore. Everyone has heard of the “… For Dummies” product line so I figured, what better place to start. 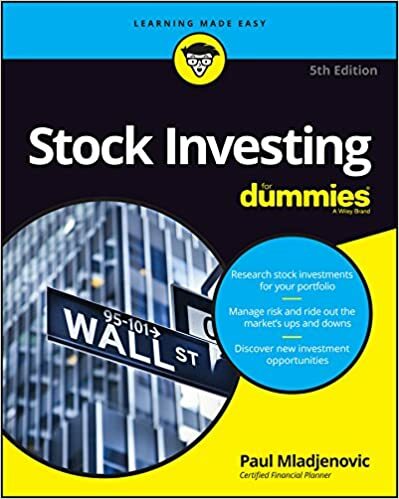 After reading this Stock Investing for Dummies Review, you will know what’s covered in this book, how easy it is to read and how much value is found within. The Essentials of Stock Investing – This section focuses on explaining what stocks are and goes in more detail related to individual stocks as well as funds that consist of many stocks. It also discusses analyzing your current financial situation, coming up with goals and laying out basic strategies to investing. Before You Start Buying – This section discusses that stocks can be used for growth and/or income depending on which strategies you choose. It also talks about different brokers and helps you choose what type of broker you want to deal with. Next it walks you through some technical analysis techniques. Picking Winners – This is one of my favorite sections! This talks about how to analyze companies and determine which ones are truly opportunities and show the most potential to help you earn profits! Sound fundamental analysis is stressed hear so you can learn what to look for and not just throw darts at a list of stocks on your wall! Investment Strategies and Tactics – This is where you get to a few of the more advanced tactics. You’ll learn how to ensure your costs are kept low when trading, how to setup triggers and conditional orders, and how to pay close attention to what company management is doing to see if you can identify buying opportunities as well as spot when you may want to sell. The Part of Tens – This section goes over 10 opportunities and challenges for investors and helps you consider what you may want to do if your portfolio is up as well as what action you may want to take when it is down. Appendixes – This section is for resources that author thinks may be valuable to you. I found Stock Investing for Dummies to be extremely easy to read and was surprised after reading the title, just how much information was actually in the book. I was concerned it would be too basic since I had some foundational knowledge already. I found quite a bit of things I already knew in it but the way the book is laid out, it’s extremely modular meaning that you can jump around with easy to ensure you only read sections that apply to your level of familiarity with the subject. There are tons of illustrations and visuals that making comprehending the stock market easy for anyone. Overall, this will not teach you everything you need to be a professional trader but it will teach you enough to make you comfortable to get started. As a first book about the stock market, I’d say it’s hard to beat. If you have any questions or comments, please leave them below and I’d love to know your thoughts. Also, if someone you know may find interest in this review, please share this also! If you want to pick up Stock Investing for dummies, you can do so here! Thank you for this insightful review of Stock Investing for Dummies. I would also consider myself a beginner at stocks. I have had three or four different 401Ks now, and had to take out two of them over my lifetime. I become pretty good at finding the one with the highest returns. The main problem was that I couldn’t stay at a job long enough to really make that 401K grow to its potential. I definitely need to learn more about the stock market basics and why trends happen the way that they do. My major was in architecture, so I didn’t have a ton of time to devote to learning finance and economics. I appreciate you walking us through what the book does and does not cover. That is very useful to know ahead of time so that I know if I’m wasting my money or not. Since I’ve been recently laid off, I’m debating whether to take another 401K out or just re-invest it into something else. Are there more advanced books on the stock market that you would recommend? It seems like you have great deal of experience in this niche. I look forward to reading more about your opinions on the market. Thanks for the comments! Also, I’m humbled that you found my review helpful. Choosing to withdraw a 401k is never an easy decision. This book does an excellent job covering basics about all aspects of investing in the market. A couple more books that I plan to review soon are “The Intelligent Investor” by Benjamin Graham and “Beating the Street” by Peter Lynch. Both authors are incredible investors that can teach a lot about their methods of value investing. Thanks for this book review Eric, I am a complete dummy as far as stock buying and marketing is concerned. I could do with a copy of this book as I am curious to know. It would be good to read about what the stock market is all about in simple language. Is this book sold outside the us? The book is very plain spoken and easy to follow. It also is designed for any level of investor. Someone with no experience will actually get the most out of this book. This book can be purchased and shipped through Amazon to many countries outside the US. Great question! I’m never into such stock investment and I don’t what to talk about it. But reading this review there could be something which you can have it informative before you engage in whatever investment you want to go into and that is the “dummies”. It’s proper to be guided when entering into a business and that is clearly discussed in the dummies presented in this review. Thanks for the comment! Knowledge is always at the foundation of wealth.